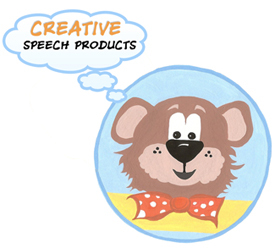 Welcome to Creative Speech Products, the home of Teddy Talker™! Here you will find comprehensive language-based materials and methodology to promote interactive, kid-powered, hands-on learning for young children. Creative Speech Products was established to develop educational tools that excite children, engage families and enthuse professionals. Our goal is to collaborate with professionals and families to build a strong foundation for each child’s success in speech, language and literacy. Linda Siciliano established Creative Speech Products while serving children and families for nearly 38 years. In addition to her experience as a speech-language pathologist, Linda has worked as a special education and early intervention teacher, teacher of the deaf/hearing impaired, assistant principal and principal. During Linda’s tenure as a principal, she was one of sixteen principals across the United States selected to serve a two-year term on Scholastic Book Fair’s inaugural National Principal’s Advisory Board. Her teaching experience ranges from preschool to college level students. Teddy Talker® was built from a strong interest in “hands-on” learning throughout her career in education. It was apparent that some children needed a more multisensory bridge to articulation, phonemic awareness and early literacy.Linda wanted to transform learning these important skills through interactive hands-on materials connecting speech to print. So “Teddy”, her multisensory bear, was born more than a quarter of a century ago as a result of seeing how children communicate so enthusiastically with puppets (and yet he still looks so young)! As an educator and parent, Linda felt the importance of inviting the imagination of children and physically engage them in learning. 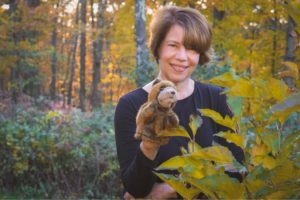 As the founder of Creative Speech Products, Linda built Teddy a home, and she strives to develop kid-powered materials for speech, language and early literacy. 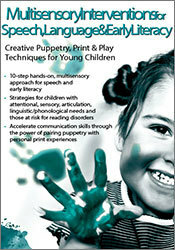 Linda currently provides professional development on multisensory interventions and creative techniques through puppetry, print and play. For more information about professional development and private workshops, click here. Check out our Testimonials to see what teachers and educators are saying about Teddy Talker products! For digital versions of product instructions, as well as sample Teddy Talker lessons — visit our Downloads page. Check out our Terms and FAQs, find out more about The Teddy Talker Tool, and please, feel free to contact us!